al-Qaeda (Tanzim Qa`idat al-Jihad) is an Islamic group for global jihad. It has been designated as a terrorist group by most governments. Terrorism can be commendable and it can be reprehensible. Terrifying an innocent person and terrorizing them is objectionable and unjust, also unjustly terrorizing people is not right. Whereas terrorizing oppressors and criminals and thieves and robbers is necessary for the safety of people and for the protection of their property.... The terrorism we practice is of the most commendable kind for it is directed at tyrants, the traitors who commit acts of treason against their own countries and their faith and their own prophet and their own nation. Terrorizing those and punishing them are necessary measures to straighten things and to make them right. It's enough that the two honorable sheiks, Sheik Osama and Sheik Ayman, remained like a lump in Bush's throat, and he tastes their bitterness morning and night. Secondly, the Jihad continued until Judgment Day. Omar Bakri, Islamist Sheik Omar Bakri, Who Fled from London to Lebanon, Declares His Support of Al-Qaeda, Criticizes Hizbullah and States: The Prophet Muhammad Also Killed Civilians. MEMRI (January 8, 2008). Al-Qaeda and its allies have no clear demands for the middle east. The only common thread in their approach is a violent and destructive opposition to democracy in any form. They find democracy in Palestine abhorrent and seek to destroy it. … Al-Qaeda finds democracy in Israel abhorrent and seeks to destroy it. It finds democracy in Afghanistan abhorrent and seeks to destroy it. Now it finds the democracy in Iraq, which the United Nations is trying to support and establish, so abhorrent that it does whatever it can to try to destroy it. … Al-Qaeda's methods, too, are different. It recognises no common bonds with people who have different beliefs and its members are prepared to kill indiscriminately. Indeed, mass murder is their explicit objective — the measure of success in their terms. Their methods of recruitment bear more comparison to self-destructive cults than political movements. However, we must acknowledge that their modern nihilism is innovative, flexible and cunning. al-Qaeda and the networks that are inspired by it approach the task with all the resources of modern technology and all the focus of modern zealotry. The most important conclusion to draw from this analysis is that there is no particular Government policy decision, or even an overall policy stance, which we could change in order somehow to remove our society from the al-Qaeda firing line. Its nihilism means that our societies would cease to be a target only if we were to renounce all the values of freedom and liberty that we have fought to extend over so many years. Al Qaeda has failed in its goals. 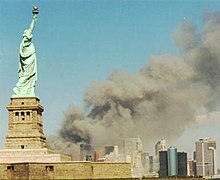 The United States has succeeded, nto so much in winning the war as in preventing the Islamists from winning, and, from a geopolitical perspective, that is good enough. [W]hat al Qaeda is fighting for is a traditional understanding of the family. This is not a minor part of their program: it is at its heart. The traditional family is built around some clearly defined principles. First, the home is the domain of the woman and life outside the house is the purview of the man. Second, sexuality is something confined to the family and the home, and extramarital, extrafamilial sexuality is unacceptable. Women who move outside the home invite extramarital sexuality just by being there. Third, women have as their primary tasks reproduction and nurturing of the next generation. Therefore, intense controls on women are necessary to maintain the integrity of the family and of society. In an interesting way it is all about women, and bin Laden's letter [to the U.S.] drives this home. What he hates about America is that it promotes a completely different view of women and the family.